While U.S. Presidential candidates start coming out of the woodwork, it’s election season here at Messiah College. Our potential Student Government Association leaders are gearing up for the Debate Night where they will answer questions directly from the students they hope to represent. To brush up on what each pair is looking to do for you, we’ve put together the key points. Amongst the candidates running are the duo of Logan Buffington and Ashley Mathew. Buffington currently serves as the Vice President of Finance for SGA and is an active member of many student groups, while Mathew serves as an RA in Mountain View Residence Hall and also holds membership in a variety of organizations. 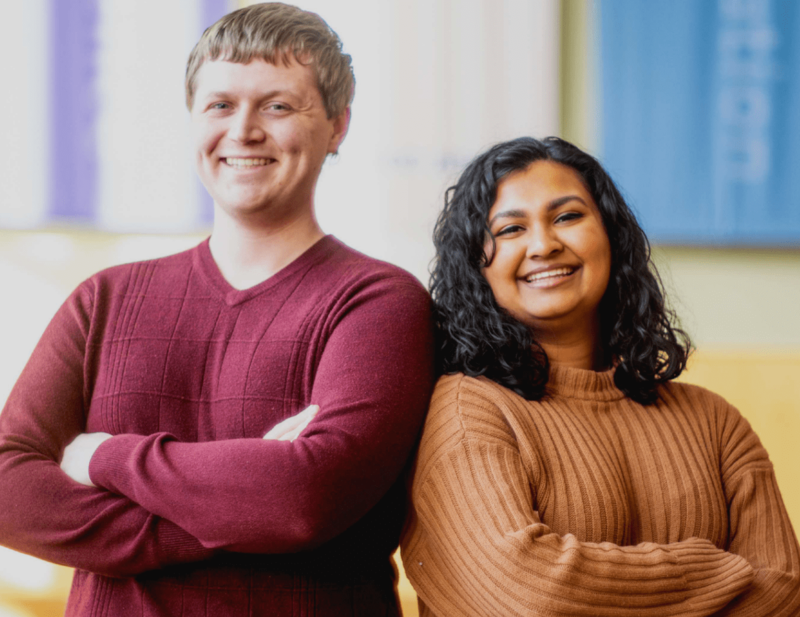 Already in leadership positions, Buffington and Mathew saw becoming President and Vice President as another way to serve the student body The pair has chosen to focus on transparency, accessibility and inclusivity for their campaign. “As SGA leaders, we believe it is our responsibility to be a bridge between the student body and the administration, and that also requires us to be transparent leaders as well,” explained Mathew on MC77’s Town Hall featuring the candidates. Buffington and Mathew plan to create a monthly newsletter for students to read that includes what SGA and student leadership are doing. In addition, the pair are hoping to create a feeling of accessibility for the student body in relation to student leaders through open door days and connections created between the diverse groups on campus. As for inclusivity, Mathew explains that they will act as advocates for the marginalized groups at Messiah. When prompted about what Messiah needs most from an SGA President, Mathew brought up the desires they found when meeting with executive clubs around campus. Most voiced the desire for more collaboration and connection. “Community is often a buzzword on campus, and people say they have it, but when you ask them to define it, they probably wouldn’t be able to tell you. But we are all about genuine relationships,” Mathew said. 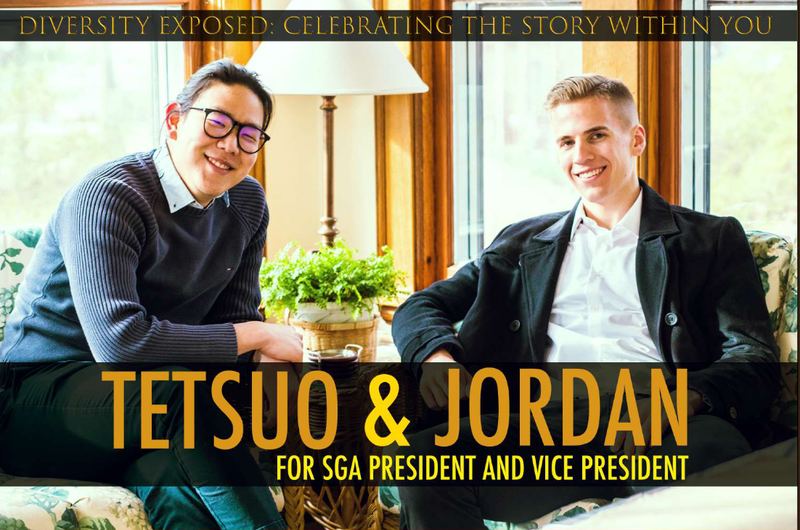 Their competition, Tetsuo Takahara and Jordan Sponsler, decided to run due to their shared desire to serve Messiah’s campus at a deeper level. Takahara, an international transfer student, knew from the beginning of his time at Messiah that he wanted to be involved in SGA. He jumped at the opportunity to represent his peers as a student senator. Now, Takahara also acts as an RA in Mountain View. Meanwhile, Sponsler knew he held a passion for helping others find a home away from home at Messiah, just as he did through getting involved in the Multicultural Council. “It wasn’t until I started getting involved that I felt I had found a place where I belonged. I really wanted to help other students find that sense of home at Messiah sooner than the beginning of their junior year,” Sponsler said. Takahara and Sponsler seek to put their vision of a “diversity umbrella” into place. Takahara explains that the two see diversity as a word that has become a stereotypical term. To remedy this, they will work to create inclusivity and reconciliation through their platform initiatives. “If diversity is an umbrella that Jordan and I want to hold up, inclusivity means making sure everyone is under it and out of the rain. Reconciliation means having everyone under the umbrella get along,” Takahara said. The pair seeks to reconcile the “tension” that exists for students as they try to navigate college and the choices that come with it. Their slogan, “Diversity Exposed,” is an effort to address the tension the candidates have felt themselves as they chose friends and tried to balance social groups. “We want to redefine what diversity means while bringing to light the stories within us that are often neglected in the pursuit of diversity and reconciliation,” Takahara said. To achieve this, Takahara and Sponsler’s initiatives include creating a Messiah app that gives students access to event schedules and menus all comprised into one program. They have also brought up the idea of including a direct line to SGA that students can use to communicate suggestions that they see could be implemented. Another initiative includes giving commuters more access along with giving students who primarily have classes in Climenhaga and the High Center options for rest and food in between classes. “We are looking to partner with groups on campus that we feel often get left out of conversations,” said Sponsler. Both groups have used the words inclusivity, accessibility and transparency in defining their campaigns. With the candidacies looking similar on paper, Takahara and Sponsler explained that both groups are fighting on behalf of the student body office through their platforms; it is a matter of who the students think will best fit the position. Buffington, Mathew, Takahara and Sponsler are looking forward to the debate to hear your questions. Attend the debate to hear more about their plans for office and to ask about them for yourself tonight at 6:30 p.m. in the Union.